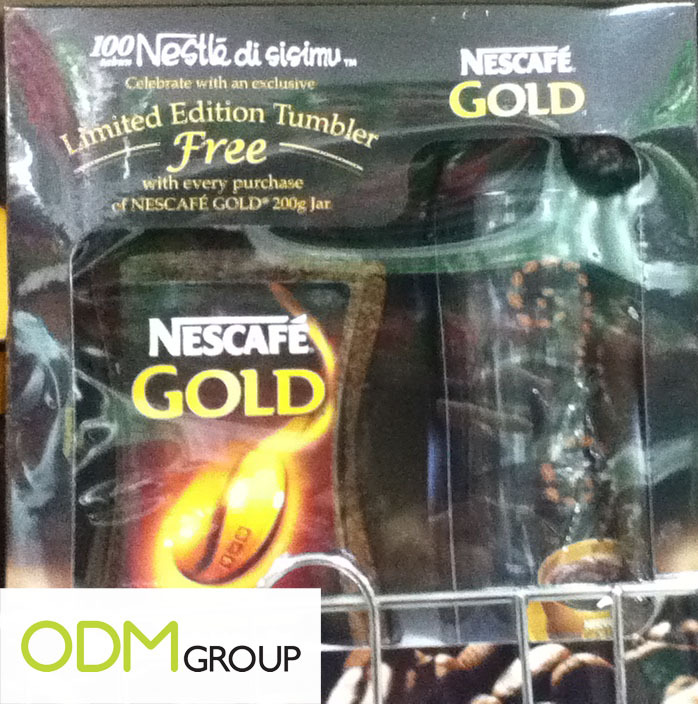 Following our previous gift with purchase promo by Nescafe on its On Pack Silicon Cup in Singapore, our ODM staff spotted this On Pack Promo in Penang, Malaysia. For every promotional pack purchased, consumers will get a limited edition Tumbler for free! Nescafe Gold On Pack Promos..
Nescafe Gold is certainly known for their attractive On Pack Packaging as we can see from their previous Ceramic Mug Promo. This allows them to stand out from its competitors and capture the eyes of consumers. As this promotional gifts complements with the main purchase, all coffee lovers will potentially purchase it! A convenient and handy promotional item whereby it could be used to store hot beverages as well. Perfect for on the go, this travel mug could be used in one’s everyday life! Logo is also printed on this promotional products too, reminding consumers of your brand. A form of marketing strategy that is adopted by many companies!